As Joshua was giving directions to the fighting men of Israel, they committed to do whatever he commanded them to do and then they finish their statement with some very important words – Be strong and courageous. Didn’t we just hear God say that same phrase to Joshua several times? 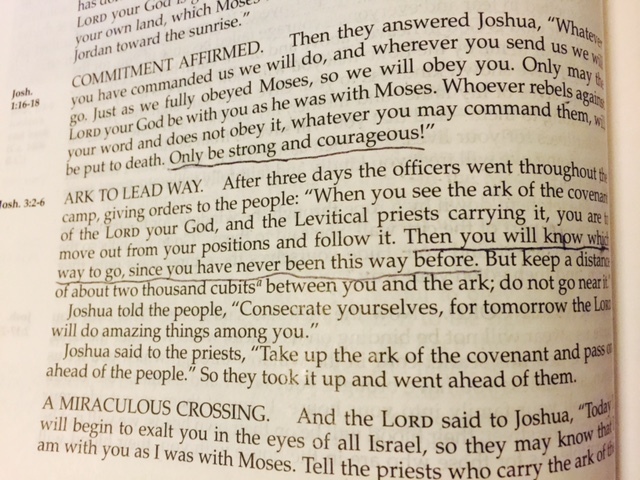 God has just told Joshua that his strength and courage would need to come from God himself. Joshua would not be able to do what he was going to need to do on his own. Now the Israelites were telling Joshua that they needed him to be strong and courageous. He was their leader. They needed him to be relying on God so that they could all be successful. We need the same thing from our spiritual leaders today. We count on them to be in-line with God so they are hearing his voice and doing his will. Some of us are in positions of spiritual leadership and this reminds us of our huge responsibility to keep in step with the Holy Spirit. It is never about what we want – it’s all about what God wants. When our faith is strong, we are hearing and we are following. If we’re not in this good place with our faith, we should not be in a position of spiritual leadership. If we’re not listening, we become an obstacle to God’s will being done here on earth. When we’re relying on God, he makes us strong and courageous – qualities that are required for spiritual leadership. Those that are following us are counting on it. Thank you for strength and courage, dear Father.